There was a 20-30% chance of "light sleet or a dusting of snow" last night. In response, schools announced that there would be no school today. I'm not kidding. That's not a live video link--just a screen print--but I'm sure you're not missing anything. It's probably just footage of dumbasses sliding into each other. 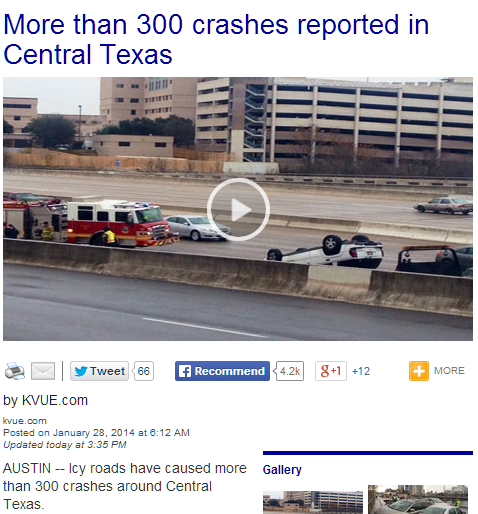 There was a 20-car pileup on one of the highways this morning. I drove to P. Terry's (2 miles away, on back roads) for banana bread and large amounts of diet soda (while I tested the 1.01 update of Gridiron Solitaire, which is now live), and I realized as I walked from the car into the restaurant that it was the coldest I've felt in a long, long time. 27 with 20 mph winds, so the wind chill was about 12F. I was wearing jeans, a t-shirt, a long underwear shirt, and my rink jacket. For Austin, that is heavy-duty winter garb.